Living… in the Los Angeles area in an Arts and Crafts style house that he has lovingly filled with period furniture. Alan’s younger son, Charlie, lives with him, although he’s fully grown. Alan is trying to get him to become more responsible and look after the house, but so far it hasn’t been a success. Profession… retired urban planner. Now, he spends most of his time managing his sons’ personal lives, and volunteering for causes he believes in. Back in the day, he was an anti-war activist. Interests… architecture, baseball, golf, and chess. Alan enjoys games, and he’s trying to persuade Charlie to get into golf with him. His older son Don is just as into baseball as he is, though, and they share a strong enthusiasm for the sport. His wife used to do puzzles a lot, and now that she’s gone, he’s continued the hobby. Relationship Status… widowed. His wife Margaret died recently, and everyone in the family took it pretty hard. Since then, he hasn’t dated, but he’s tried to fill the shoes of two parents when it comes to his (now adult) kids. Challenge… helping his sons find balance in their lives – and finding some in his own life, too. He worries about his sons’ workaholic nature, because he’s concerned that they’ll never be able to settle down and have a family. Both his sons are brilliant, but Alan fears they overlook the smaller things in life, at a cost. Alan also has himself to worry about. Will he be able to move past his wife’s death, and create a new and active life for himself? Personality… laid-back, patient, and kind. Alan is very intelligent and capable, but doesn’t give himself enough credit, believing that his sons have long since outstripped him. He is much more relaxed than his sons, but he isn’t lazy. Overall, he’s loyal to his children and to his beliefs, and he’s a hard worker who can still crack a joke. Alan Eppes's popularity ranking on CharacTour is #5054 out of 5,000+ characters. See our top-ranked characters and read their profiles. Numbers is an American crime drama television series that ran on CBS from January 23, 2005 to March 12, 2010. The series was created by Nicolas Falacci and Cheryl Heuton, and follows FBI Special Agent Don Eppes and his mathematical genius brother Charlie Eppes who helps Don solve crimes for the FBI. Brothers Ridley and Tony Scott produced Numb3rs; its production companies are the Scott brothers' Scott Free Productions, CBS Television Studios. The show focuses equally on the relationships among Don Eppes, his brother Charlie Eppes, and their father, Alan Eppes, and on the brothers' efforts to fight crime, normally in Los Angeles. A typical episode begins with a crime, which is subsequently investigated by a team of FBI agents led by Don and mathematically modeled by Charlie, with the help of Larry Fleinhardt and Amita Ramanujan. The insights provided by Charlie's mathematics were always in some way crucial to solving the crime. The series was the most popular show airing on Friday evenings throughout its first four seasons. 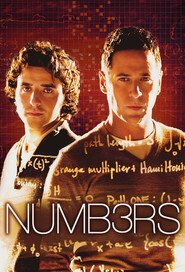 In May 2010, CBS announced that Numb3rs had been canceled after six seasons.